Life-changing events such as divorce and separation can be overwhelming. Family members struggle to maintain stability in their day-to-day lives while dealing with the legal and financial consequences of the dissolution of a relationship. If you are involved in a divorce or separation, or if you are involved in a Family Court matter, you would be well advised to seek the services of seasoned legal professionals who can help to guide you through this difficult period of your life. While you and your loved ones are recovering from the emotional impact of a split, the attorneys of Gordon, Tepper & DeCoursey, LLP, will manage the practical matters associated with the divorce or separation, such as determining fair arrangements for spousal support, child custody, and equitable distribution of the assets. We also handle all Family Court matters. Our Upstate New York firm treats each of our clients with the respect, compassion, and confidentiality that their sensitive circumstances necessitate. 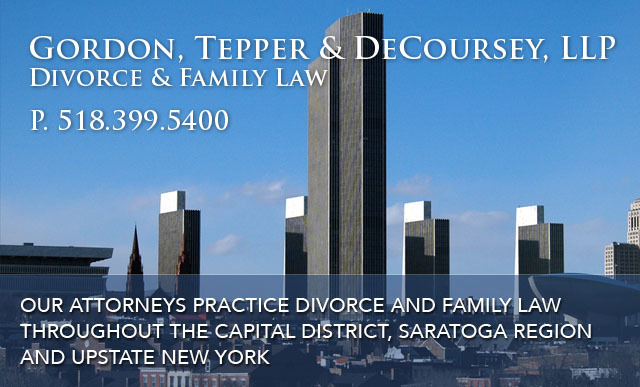 If you live in the Capital District, the Albany, Saratoga, or Schenectady regions of New York or Upstate New York, and need a family law or divorce attorney, please contact Gordon, Tepper & DeCoursey, LLP, to schedule a consultation. 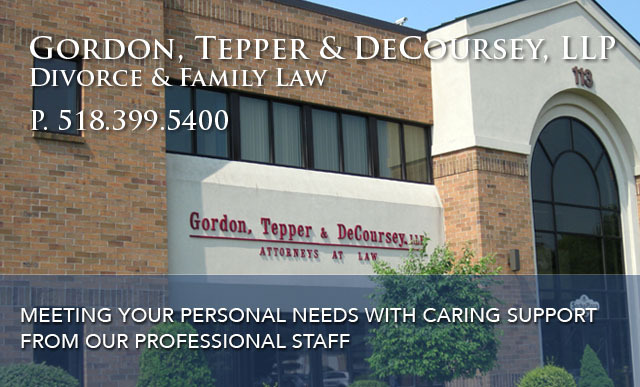 The family law attorneys of Gordon, Tepper & DeCoursey, LLP, are among the most experienced and knowledgeable in the field, their résumés filled with impressive accomplishments. You will find lawyers in our firm who have completed degrees at highly prestigious institutions, earned the highest possible peer ratings from Martindale Hubbell®, enjoyed inclusion on "The Best Lawyers in America" publication, been selected for inclusion in New York Super Lawyers, chaired executive committees or served as officers for the local bar association, lectured extensively on family law topics, and made other significant contributions to the legal community. 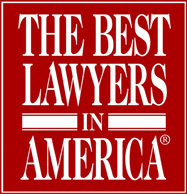 We have also been selected for inclusion in "The Best Law Firms in America" in the Family Law Category, as published by U.S. News. To learn more about our legal team, please contact our firm by filling out the form on the right hand side of this page. Family law matters are personal and sensitive. Our lawyers hold themselves to the highest standards of integrity and professionalism while representing clients in child custody and visitation, and child and spousal support, adoption, domestic violence, and paternity cases. We are trusted and experienced consultants, providing representation and legal advice for pre- and post- marital agreements, real estate transactions, wills, matrimonial and family law appeals, and other delicate family law matters. Our attorneys will always approach your case with the respect and confidentiality that you and your family deserve. If you would like to schedule a confidential consultation with one of our family law attorneys, serving Schenectady, Albany, Saratoga region, the Capital District and surrounding New York communities, contact our Glenville office. One of the divorce lawyers at our firm would be happy to answer your questions. 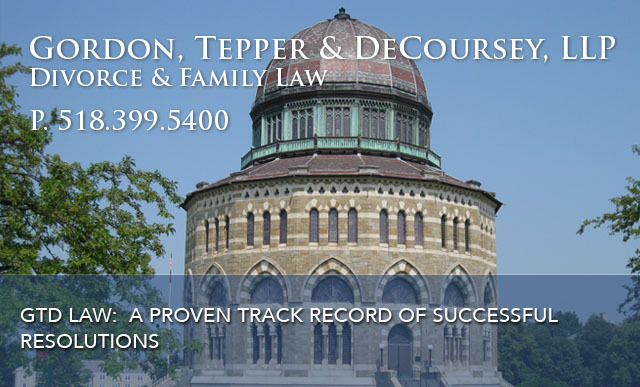 Gordon, Tepper & DeCoursey, LLP proudly serves all areas of the Capital District and Saratoga Region and surrounding communities, such as Schenectady, Albany, Saratoga, Rensselaer, Warren, Washington, Montgomery, Fulton and Schoharie Counties, including places such as Saratoga Springs, Clifton Park, Malta, Wilton, Burnt Hills, Ballston Lake, Ballston Spa, Schenectady, Niskayuna, Glenville, Scotia, Rotterdam, Duanesburg, Albany, Loudonville, Delmar, Colonie, Troy, Lake George, Glens Falls, Amsterdam, Gloversville, and Johnstown. Turn to our family law and divorce attorneys in the Albany, Schenectady, and Saratoga, New York region, for dependable consideration of your case. 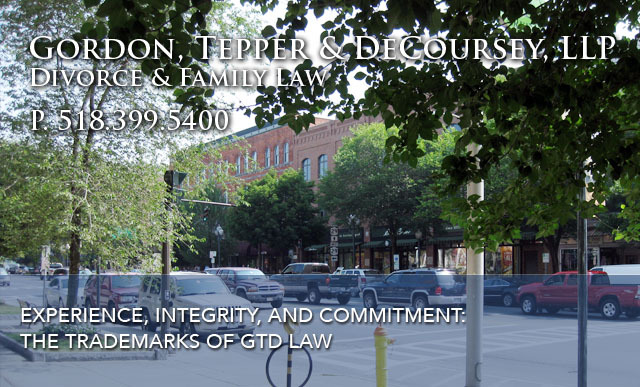 Gordon, Tepper & DeCoursey, LLP has earned the highest possible peer rating ("AV") by Martindale Hubbell. Prior results do not guarantee a similar outcome.